Moments of shooting light were fading fast when splashing in the nearby creek incited an adrenaline rush. I immediately stood and reached for my bow. The culprit? A shooter buck. At 30 yards and broadside, he was toast. I double-lunged that September Nebraska buck, and he was the egg that hatched something I annually thrill over: bowhunting whitetails as a nonresident on America’s public lands. Growing up in northern Wisconsin and hunting it extensively since the age of 12 taught me that patchwork real estate and heavy hunting pressure don’t equal great hunting. Sure, some buster bucks roam the big-woods country, but they’re difficult to peg and move primarily after dark, especially on public lands. I could feel my enthusiasm dwindling. Without private lands at my disposal, it became time to explore new horizons. My first few whitetail trips didn’t go great. Make no mistake; there is a learning curve. But, I saw more and larger deer than I did around home, which really opened my eyes to the idea of traveling for public land bucks. It need not feel like work. Instead, it can feel like an adventure. Today, many of my week-long hunts to unknown places end successfully, and several of the bucks I’ve taken during these wayfaring bowhunts deserve their places on my wall. To bowhunt whitetails successfully on public lands as a nonresident requires hours spent researching states and specific areas, as well as potential stand locations. Set goals and do your homework, and you can have a successful hunt. As a full-time freelance outdoor writer, I’m very busy. I make ends meet by logging extensive hours behind a computer screen. I’ve found that putting all my whitetail eggs in the Wisconsin basket gets me little content to write about. So, I focus on writing while I’m home, and concentrate on hunting while I’m away. Beyond that, I’m adventurous. Routines tire me. I welcome change. Traveling to parts unknown excites me. Whitetail hunting must excite you, too, and if it no longer does, change must happen. Also, my track record suggests that destination bowhunts are more successful. That’s because buck age class runs higher in areas I hunt, which increases my odds of encountering a buck I want to harvest. Perhaps the three reasons I’ve mentioned here resonate with you. Good news: You can re-find the whitetail vigor you once had with a far-flung whitetail trip. Here’s how. Stepping onto unknown ground automatically stirs a myriad of feelings. It’s simultaneously exciting and intimidating. It’s comparable to the moments preceding a roller-coaster ride, and I love it. Caution: Don’t just throw a dart at the map or go somewhere because a buddy did/does, especially if you have expectations in mind. Antoine de Saint-Exupéry said, “A goal without a plan is just a wish.” This advice applies to whitetail road-tripping, too. So, let’s talk about goals. I set them before I plan hunts. Then, I choose a state and specific area accordingly. For example, I don’t go looking for a 140-inch buck on public land in Pennsylvania. I’ll look to the Midwest or Great Plains for a buck like that. Personally, my goal is success on a mature buck. Might sound ridiculous, but I’m being honest. I eat, sleep and breathe bowhunting. I push my body and my equipment very hard, and I expect a return on those investments and sacrifices. Am I successful on every hunt? No. Does it hurt when I don’t kill? Of course. But, I keep my chin up and try to glean something from every single bowhunt. Enough about my goals. Set your own, and then can you choose a location that aligns. If your goal is to hunt mature deer, select a state that produces them. To kill one, they must exist, and hopefully in abundant numbers. Obviously, Iowa and Kansas immediately come to mind, but deer tags in those states require applying in the spring, plus they’re expensive if you draw. Several states offer nearly the same hunt quality, but with affordable OTC tags. Of course, hunting pressure can be slightly higher, especially during the rut. Remember, we’re talking public land. 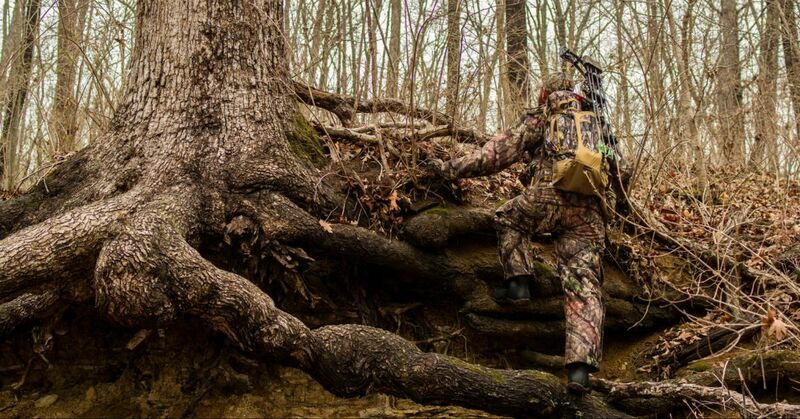 Thus, you might consider an early season hunt when pressure is lower. Once you settle on a state, you must narrow your search to a specific area through extensive research. Friends who are successful bowhunters can be valuable resources. No, they probably won’t hand you a map with their prime treestand locations, but they can provide subtle details that will help you. Perhaps you can even pair up with one of them to cut fuel, food and lodging costs, not to mention bridge the learning curve. Not only will traveling with a buddy cut costs, but it's nice to have a hand when it comes to dragging out a public land buck. Online bowhunting forums provide little in the way of helpful information for planning your hunt. For example, multiple locations where I’ve had great hunts were described in online forums as some of the worst. Maybe it was a scare tactic to keep other hunters away, or maybe these posts were made by folks who walked 50 yards from a major parking area and didn’t see a deer. Who knows. My point is that you can’t trust what you read online. Of course, there are good-natured folks on these forums, too, who are willing to toss a dog a bone. Some may even provide a list of good spots to try bowhunting, but rarely. When researching new places to hunt, I call local sporting goods stores, filling stations, motels and even libraries to ask questions or be connected with someone who knows something about the local deer hunting. Obviously, wardens and wildlife biologists are afield weekly, and chances are they know what the area can produce. However, understand that these folks are often hunters themselves, so don’t ask for free hunting-location handouts. Politely ask to be pointed in several good directions. A smartphone app denoting property lines with aerial and topographical layers is irreplaceable when venturing onto new grounds, plus it will help you identify public-property boundaries so you can remain within them. The final piece of the planning puzzle is to study aerial imagery and topographical layers. I prefer the ScoutLook app. The premium version offers property lines denoting ownership, which is a real plus to keep you within public boundaries. Next, consider the habitat. If you’re from the Midwest or East where timber is heavy, you’ll need to adapt quickly if you hunt a place like western Kansas where trees are few. I almost always focus on public parcels that abut a river. Find a river-bottom, and you’ll find whitetails. Now, it’s easy to choose stand locations around fields, because that’s where you’ll find the most deer sign. However, I find the best and most predictable movement, especially for archery hunting, is had along travel routes and funnels. Always be mindful of prevailing winds when determining possible stand locations. During a week-long hunt, you might not get the right wind for a given stand, so you must be flexible and have backup plans. It’s not always practical, but taking a pre-season scouting trip to your chosen destination can help you be more productive when your hunt arrives. As I’m typing this, I’m just days away from a Nebraska spring turkey hunt. I wouldn’t be going except that I’ve become particularly interested in a particular state-owned tract for a fall whitetail hunt. I’ll get to walk the ground and decide if it’s worth the trip back come fall. Planning and executing a whitetail trip is hard work, but any diligent, hard-working bowhunter with an adventurous spirit can make it a win. If whitetail hunting around home feels like a chore, spice up your fall.